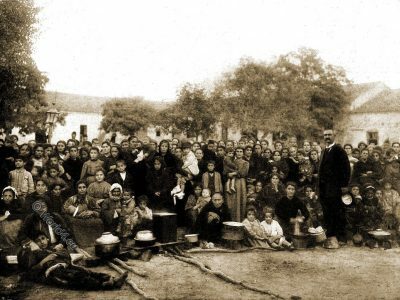 Marquis Dufferin Ava with Armenian refugees. Home » Marquis Dufferin Ava with Armenian refugees. Marquis Dufferin Ava with Armenian refugees at the hospital at Varna, Bulgaria 1896. Frederick Hamilton-Temple-Blackwood, 1. Marquess of Dufferin and Ava, born June 21, 1826 in Florence; died 12 February 1902, was a British diplomat and statesman, Governor-General of Canada, and Viceroy of India. The massacres of the Armenians from 1894 to 1896, also Hamid massacres, were mass crimes against the Armenian population in the Ottoman Empire in the years 1894 to 1896. The massacres were prompted by the Ottoman government – especially by Sultan Abdulhamid II. The massacres committed in the region Sason and were then extended to all Armenian settlements. The death toll was between 80,000 and 300,000. With the help of the local Muslim population and the Hamidiye units, deportations and looting were also carried out and also attempts to force Christian parts of the population to convert to Islam. Although the massacres were mainly directed against the Armenians, they turned into general antichristian pogroms, as in the massacre of Diyarbakır. Corinna Shattuck, a US missionary and contemporary witness, described the massacre of Urfa on December 28, 1895, in which about 4000 victims were burnt alive in a church, in a letter of 1896, “a massacre that became a great Holocaust “. Picture source: Illustrated London News 1896. This entry was posted in 1896, 19th Century, Armenia, Asia and tagged Traditional Armenia costumes on 8/25/17 by world4.